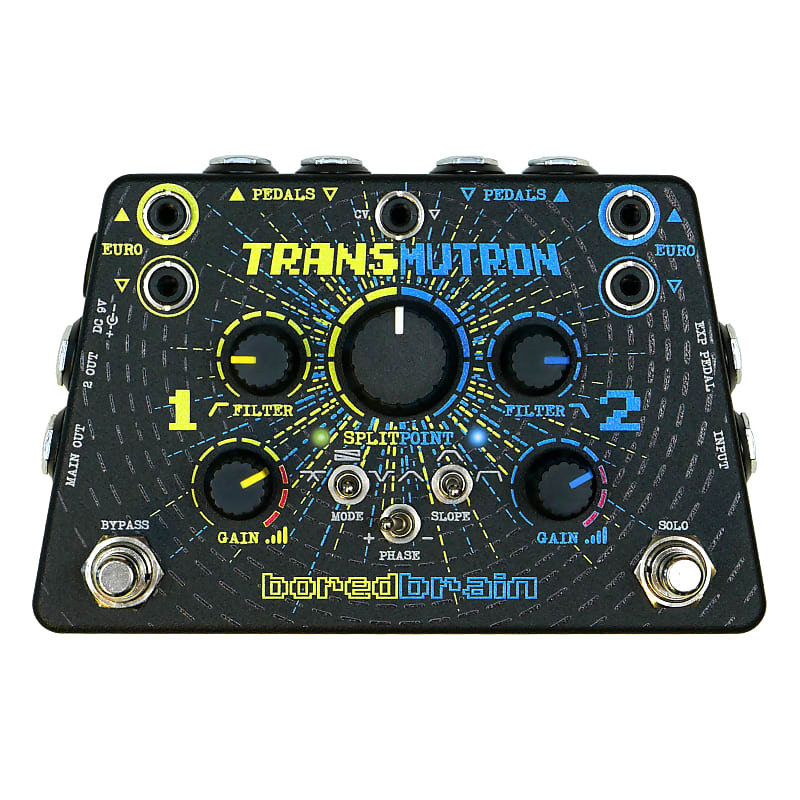 The Transmutron provides unique ways to create and dynamically control combinations of effects, while integrating pedals and eurorack modular. The Splitpoint parameter controls the crossover frequency to define the bands for each FX channel. The Splitpoint parameter adjusts the pre-FX level balance between the two channels like a crossfader. The Splitpoint parameter moves a wide, resonant notch filter across both pre-FX channel signals. In Fusion mode, the Splitpoint instead acts as a pre-FX level crossfader, rather than splitting the signal into separate bands. This allows for less extreme blends, especially when modulating. 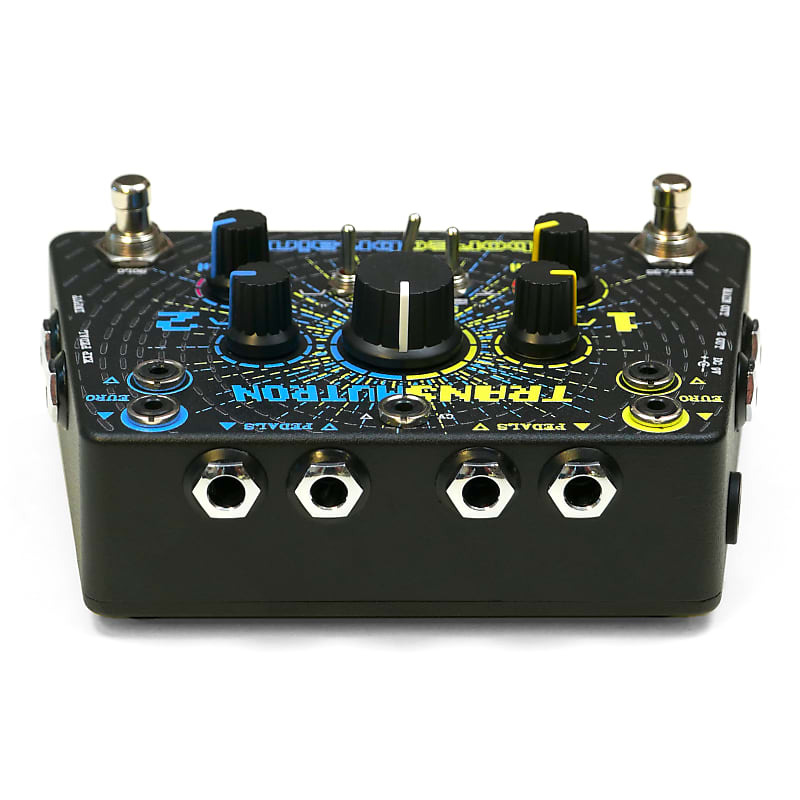 In the thirdmode, Fallout, a resonant wide-notch filter is applied to both pre-FX channel signals, cutting a hole and creating a phasing-wah effect when using an expression pedal or LFO to sweep the Splitpoint back and forth. 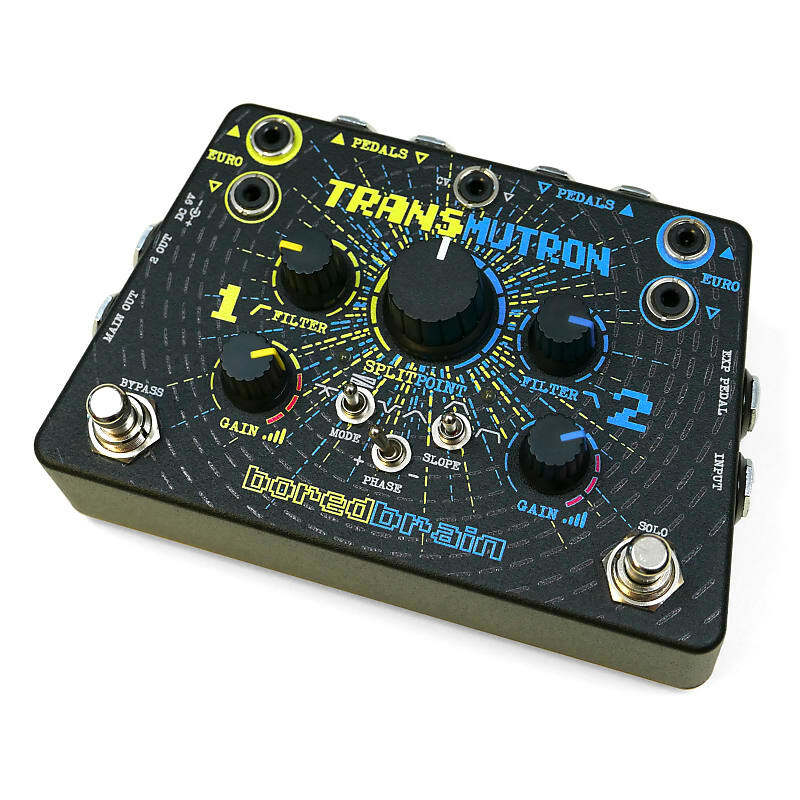 To further shape the signals sent to your effects, the Transmutron isequipped with dedicated hi and low cut filters. In Fission and Fallout modes, the cutoff frequencies of these filters also define the end-to-end sweepable range of the Splitpoint parameter and its center frequency. The filters have selectable slopes of 12, 24, or 48 db/oct, which also affects the crossover filter, and greatly enhances the resonance of the wide-notch filter. If further separation of the parallel FX channels is needed, a dedicated phase switch is on-hand. 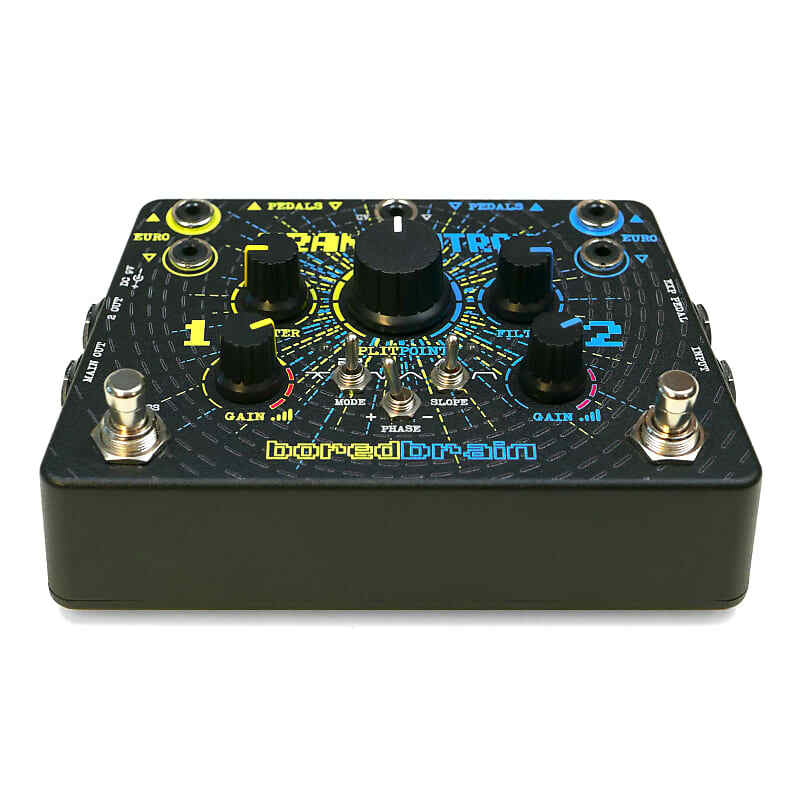 Both FX channels have two sets of sends and returns: 1/4-in for guitar pedals and line-level effects, and 3.5mm for eurorack level processing. For each channel, the 1/4-in and 3.5mm FX loops can be used simultaneously, as they are in series (3.5mm then 1/4-in). The FX sends are half-normalled so they can be used as buffered copies without affecting the returns. Additionally, the 3.5mm FX loops for each channelcan be independently switched to pedal/line-level using internal dip switches, which allows for seamless integration with the . How complex the reaction is up to you! 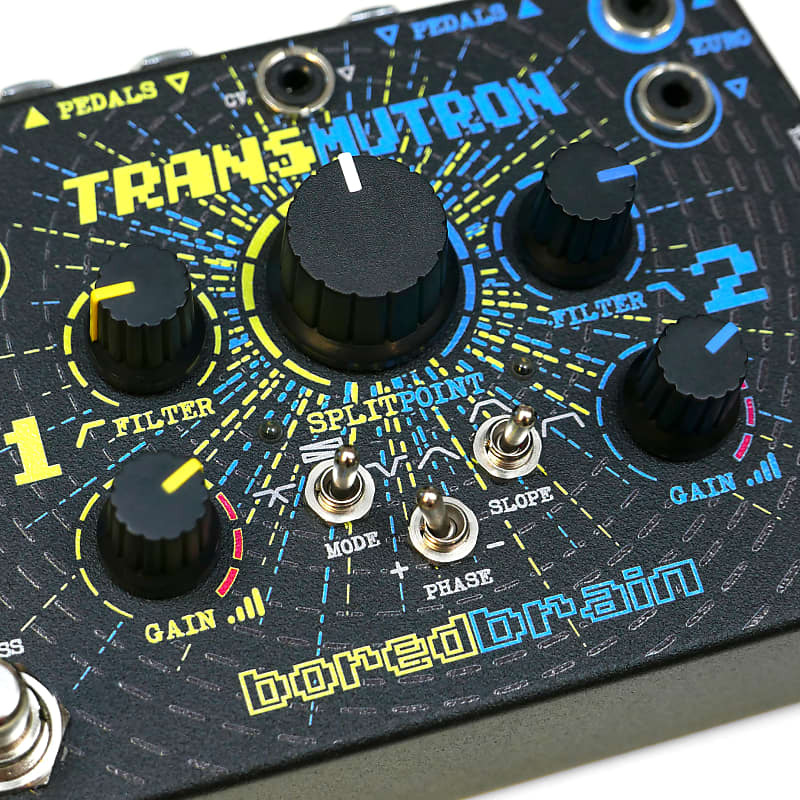 From simple tone shaping usingonly a couple effects, to interconnected combinations of pedals and eurorack modulation madness, the Transmutron is just the tool you need to reactivate your effects! We currently only ship CONUS and apologize for any inconvenience. If you would like to purchase outside of the lower 48, please visit our website. Thanks.